If you’ve got an awning you’ll know how lovely it is to sit out in your garden and enjoy it all year round whatever the weather. To keep your lawn looking lovely and your flowerbeds feeling fabulous we’ve pulled together all of our favourite gardening tips and jobs for each month of the year. This calendar starts from March and takes you right round to February. Print our guide out, keep it handy and get your garden looking tip top ready for the summer! March is the month for you to start getting back into the garden in earnest! 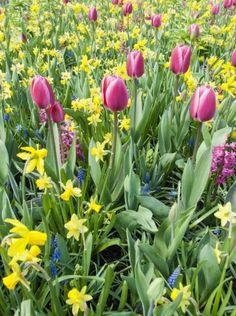 The weather is starting to improve, early spring bulbs should be beginning to flower and plants will be producing fresh growth. By mid-March spring will be showing signs of arriving. The increase in the amount of sunny days provides ample opportunity for getting on with lots of gardening tasks! 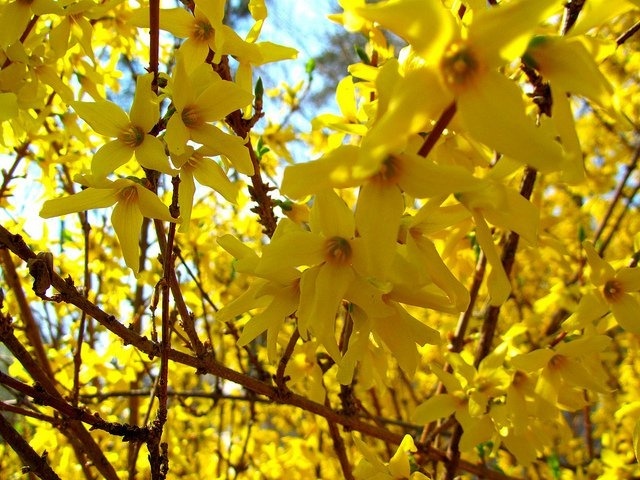 March is the best time of the year to complete your pruning on any shrubs and hedges. Reduce height by removing some of the tallest stems. Cut directly above the buds using clean, sharp tools. Start planting your favourite summer-flowering bulbs in pots, put them on a warm windowsill to begin with. Start sowing this year’s crop of vegetables! As the days begin to get warmer start planting your early crops of carrots and broad beans under cloches. Watch out for slugs and snails! Clean up leaf litter (their hiding place) and put bait down. One of the busiest months of the year for gardening, April is all about tidying and prepping. Sow seeds and get that lawn looking great. Expect to see a lot of ‘April showers’ but keep an eye out for any lingering frosts. Tidy that lawn up! Rake up any fallen leaves or dead twigs and put them on your compost pile. Re-seed or re-turf any patches on your lawn that didn’t make it through the winter months. Get your hanging baskets prepped and start sowing seeds. Weeds can start taking over as the weather gets warmer so remember to keep them under control. Removing them now will help to keep them away from your plants. Read up on your plants and flowers. Some plants can help each other if planted together so find out which will work best. The scent of garlic repels aphids for example and marigolds can help to prevent carrot fly attacks. Clean your tools! Give your gardening tools a routine and regular checkup to keep them clean, sharp and in perfect working order. Protect fruit blossom from any late frosts. Summer is nearly here, take a look at your garden and you’ll see the signs of it everywhere. More flowers will be coming into bloom and the weather is getting much warmer. Start on your lawn mowing now as it will be growing in earnest due to the rising temperatures. Refresh your flower beds. Spring bedding plants will be coming to the end of their flowering season, clear them away and prep the ground for summer flowers. Towards the end of May start planting out summer bedding. Protect any vulnerable, tender plants from late frosts. Encourage healthy growth in seedlings. Pluck them out and pot them. Towards the end of the month begin planting your tomatoes and peppers. Collect rainwater in your waterbutt (see February) and look at using more recycled water for gardening tasks. Get an awning! A great edition to any garden, an awning allows you to sit outside and enjoy the scenery whatever the weather! Use this month to revamp any tired garden furniture too – clean and paint it to get it looking lovely for summer. Mow your lawn on a weekly basis. Summer is finally here! Any danger of late frost has come and gone so take the time to relax a bit as your main sowing and planting work has been done. June 21 is the longest day of the year and the additional light and warmth means your garden will put on a bit of a growth spurt. Put your summer hanging baskets and any containers outside – take advantage of the sunshine! Keep your sunflowers well watered to encourage growth. Stake the tall flowers before they become too top heavy. Be ‘water wise’. There may be droughts or water shortages in some areas so use recycled water where possible. Sow biennials – sweet williams and wallflowers – so they will flower next summer. Shade greenhouses, they’ll be scorching in the summer heat. Mow that lawn regularly. Grass grows at twice the speed during the spring and summer so, at this time of year, you need to think about cutting the lawn at least twice weekly. Plant out your tomatoes. Get them in the ground, water them daily and feed them with tomato fertiliser when they begin to flower. 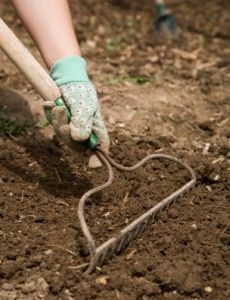 Keep an eye on weeds – make sure that you hoe regularly. Visit a local farmer’s market and start to ‘eat local’. You’ll pick up some brilliant tips on gardening as well as getting to eat some tasty veg! Your garden will now be full of colour and looking lovely. Enjoy some summer BBQs, relax with a book. Make sure you make the most of the garden you’ve put so much work into over the spring. Water regularly to get the best results, using recycled water if you can. Raise pots off the ground to encourage drainage. Take time to pick flowers from your garden to enjoy inside. Look after your bedding plants. Regularly deadhead, water and feed them. Clear any algae or debris from your pond. Peg down any strawberry runners into the soil. Come August they’ll be ready to separate from the mother plant. With a few light tasks to be completed you can carry on enjoying the fruits of your labour. If you’re heading off on holiday remember to ask friends or family to help out with watering while you’re away. Keep on watering! Continue to water plants regularly to prevent them drying out. Prune wisteria to restrain growth. This also helps to maintain side-shoots which is where the flowers develop. Look out for black spot. If you see large, purple spots on your rose leaves it could be suffering from black spot. Remove the infected leaves and burn them. Growing veg? Start harvesting carrots, onions, sweetcorn and courgettes. Collect seeds from your favourite plants. Reap the rewards of your harvest! Try out some new recipes with your homegrown vegetables. Water your tomato plants daily. Remove any yellow leaves to keep them healthy. Clear weeds regularly, they thrive in the sunshine. Watch out for greenflies! These pesky pests multiply in the warmer weather. Remove them by hand if you spot them or spray the infested plants with water. Autumn is nearly here but you should still have a few glorious days of sunshine and warmth left so be sure to make the most of them. Give your lawn some TLC. Give it a vigorous raking which will remove any dead or dying grass. Re-seed or re-turf any bare patches on the lawn. Dig up any potatoes to prevent slugs getting to them. Keep an eye on the weather. Some early frosts may be starting to creep in towards the end of the month. Carry on watering those new plants! You may get some autumn raspberries through, pick them and enjoy! Clean out your greenhouses or frames, if you have them. You’ll definitely be making use of them over the next few months. The clocks go back, those darker nights start to creep in and autumn is most definitely here. Days may still be sunny and clear but watch out for night frosts. Your garden should still be colourful – some flowers will be in their late bloom and leaves will be turning a lovely colour. Clean up fallen leaves regularly – it may seem a thankless task when more fall but think of all the leafmould you can make. If the weather is mild take this last chance to mow lawns and trim hedges back. Harvest any apples and pears. Start ordering seeds for next year. Winter is coming. Leaves are falling rapidly and wind and rain will be on the increase. Move any plants that you can into sheltered spots or the greenhouse if you have one. Remember to make sure any bird feeders and water dishes are kept topped up – winter can be very tough for birds. Carry on clearing those leaves! Especially in ponds, flowerbeds or on the lawn. Plant tulip bulbs ready for spring. Start planting out your winter bedding. Insulate outdoor containers to protect them from frost. Top tip! Use bubble wrap. If allowed in your area build a bonfire to get rid of any excess debris you’re not, or is unfit for, composting. Christmas is here, but so to are heavy frosts and greatly reduced daylight hours! Luckily at this time of the year outdoor gardening can take a backseat. Make sure you’re protected against frost and keep an eye on your greenhouse heater you don’t want it to break! Protect ponds from frost. There are a few ideas for preventing your pond freezing over, ranging from fitting a small electric pond heater or floating something on the pond’s surface. This breaks up the pond’s surface and prevents ice forming. A small rubber duck is perfect! Keep an eye on those pipes, you don’t want them freezing. Turn off the water supply to outside taps. Harvest those root crops! Leeks, parsnips, sprouts, winter cabbage etc. Perfect to use in Christmas dinner. Protect any stored produce from mice. Always keep a beady eye on your plants and make sure they’re protected against the cold – it’s freezing at this time of year! Frosts, gale-force winds and heavy rain – your garden will need a lot of protection in January! Keep an eye on any ties and stakes, they can easily get damaged in this weather. Consider moving plants to sunnier positions in the garden and don’t forget those birds! Recycle your Christmas tree. Your local council shuold organise collections this month. Trees they collect are usually shredded into chippings and used in local parks or woodland. Alternatively you can shred it yourself and use it for mulch. On sunny days ventilate your greenhouse. If able to move plants to areas of the garden that attract sunlight. Prune any apple and pear trees. Plan your vegetable crops for the upcoming year. This month we’ll start to see signs of the approaching spring. Bulbs will be appearing and light levels and temperatures are on the increase. There’s plenty to do indoors throughout February, in preparation for the coming spring. Prune any shrubs such as Wisteria and evergreen hedges. Put netting over fruit and vegetables to keep birds away from them. Get mulching! Sprinkle mulch around any plants that are starting to emerge. This will add nutrients to the soil and keep in moisture and warmth. Install a waterbutt. This large barrel will collect rainwater so make the most of the heavy rains! Use the rainwater on the garden throughout the year, especially over the summer months when there may be a shortage of water. Installing a waterbutt isn’t a difficult process. Follow the link above to find out how. There we have it, our top gardening tips for the whole year. How are your gardens faring at the moment? Do you have any other tips for us and our readers? Let us know in the comments!